A new range of custom printed t-shirts and gifts have been announced by Abarelco. The online store offers customers with design printed to order from six locations around the USA. Abarelco have announced that they stock a range of custom t-shirts and gifts. The online store provide customers with high quality merchandise that is custom printed to order. Abarelco is an online retailer with a huge range of products available, which is ever expanding. They source the best quality items for their customers and combine this quality with their great customer service for a unique internet shopping experience. The company specialize in creating custom printed t-shirts, which are printed to order from six print locations across the USA. Alongside their huge range of designs they also offer a customized design printing service, where all the customer has to do is provide the company with their own transparent design and they will do the rest. One of the latest fun designs offered by Abarelco is their tongue in cheek tennis themed design. The phrase “Of course I hit like a girl! 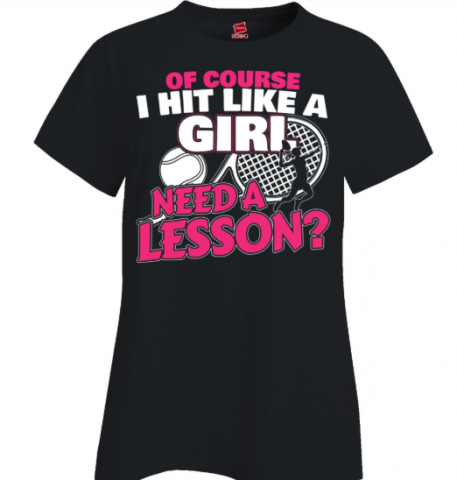 Need a lesson?” Is featured in bold pink and white letters alongside an illustration of a tennis ball and racket. Another new t-shirt is the uplifting “There is always hope” design, which is available in two styles of wording. The unisex t-shirt is also available in navy blue and comes in eight different sizes, making for a great gift for everyone. All t-shirts are created from 100% high quality, pre-shrunk cotton. Their range of t-shirts are available in kids, mens, ladies and unisex fits. The customer also has the option of having the same fun and inspirational designs printed on other items such as hoodies, mugs, fashion tote bags, phone cases, water bottles, pillow cases and much more.